The island has the most beautiful rice terraces on our planet. Don't miss the one north of the village of Tegallalang. These cultural performances include the celebrated barong, legong, and monkey dances - and the mesmerizing gamelan orchestras. 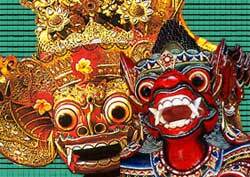 Bali is internationally famous for its painters, wood carvers, stone sculptors, silversmiths, and other artists and craftsmen. Over 10,000 temples dot the island. And fascinating temple ceremonies occur daily. A visit to Ubud generates lasting memories. There are many cultural performances as well as art galleries and ethnic restaurants.